Who does’t love a true vintage chronograph? And what is there not to love? 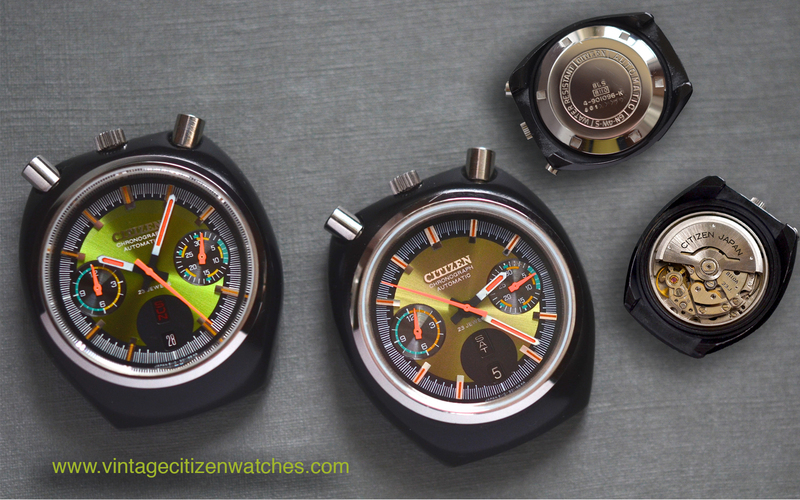 Citizen made three chronograph movements, one manual – calibre 5702 with 21 jewels (read about it HERE) and two automatic ones based on the same design – calibre 8100A and 8110A, both with 23 jewels (read about them on the dedicated page HERE). All three are fly back chronos. 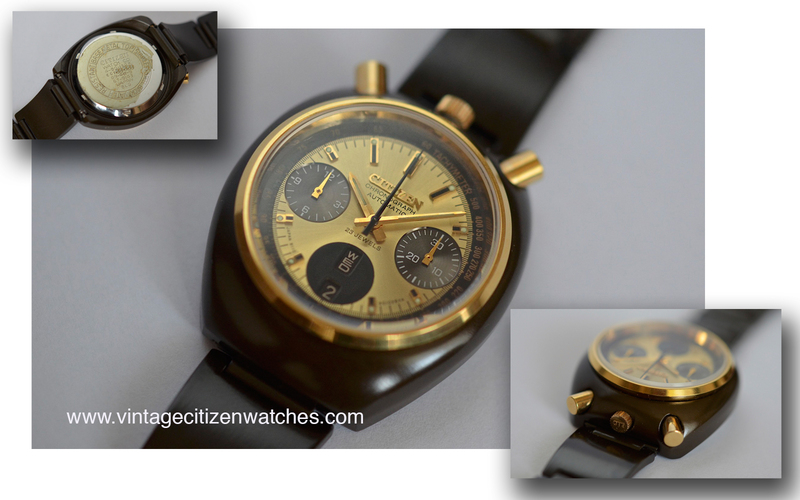 Let me introduce to you the well known, world famous Citizen Bullhead calibre 8110A! Citizen called this chronograph the Challenge Timer. As clearly seen on the collage above (pictures from the sellers mostly from sweetroad) they come in different colors and variants. The round shaped (so 1970’s) cases for all bullheads are made of plated metal base aluminum alloy (except for the stainless steel octagon one, read about it HERE). They are called bullhead because of the two pushers that are positioned on the top of the case. Those pushers (stainless steel) are there to operate the chronograph function. The one at 11 o’clock starts and stops it and the one at 1 resets it and it can also be used while the time is running and resets it and starts it in one single action. This is known as the fly back function. Most of the chronographs are not constructed like this. You can’t press the reset unless the time is stopped first, but on fly-backs that is possible. So, this is the Citizen automatic, 23 jewels, calibre 8110A with hand winding capability. It was produced by Citizen starting from 1972. It is a vertical clutch chronograph (beating at 28.800 bph) with column wheel and obviously fly back function. It is 27 mm wide and about 6.8mm high. Because of the column wheel/vertical clutch design of the movement it is better to leave chronograph running for most of the time (this way you can also see the beautiful sweeping central second hand in movement), but also from time to time it should be stopped. On top of all of this, it displays the date and the day of the week as well. A particularity for this movement is that when you want to change the day you should pull the winding crown to second position (for changing the date) and push and release the reset (1 o’clock) button. Interesting design so the interaction lucky owner – beautiful watch, is enhanced. I can’t even imagine the price of a vintage Rolex Daytona if it would have had all these features. The dials are made in a variety of colors so for sure you are going to find one that on your taste. Just pay attention to the fact that the market is flooded with fakes! The hands vary as well and are also faked a lot. It doesn’t have a current running seconds but leaving the chronograph moving you can have one, while the chronograph function, when needed, can be engaged with just a simple action – press the fly back 1 0’clock pusher and start counting from zero. So… the case can be plated: golden, dark brown-green, black, or silver. The bracelet is plated too, I have seen it in stainless steel, rubber or leather. This entry was posted in automatic, Citizen automatic chronograph, Citizen chronograph, day-date, hand winding chronograph, hi beat, vintage Citizen and tagged citizen 8110A. 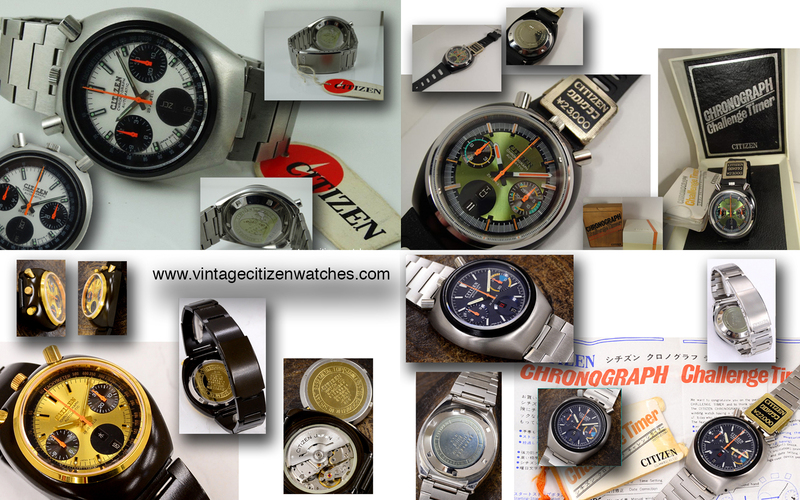 citizen automatic chronograph, citizen challenge timer, citizen fly back, citizen vintage chronograph. Bookmark the permalink. It’s ladies watch or man watch? It is a man watch. I only have 2-3 ladies watches presented on the site.